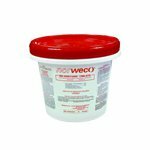 For use in large home or small commercial systems. Bio-Sanitizer tablets work effectively in all types of tablet feeders. A 10 pound pail is approximately a six month supply for a typical four bedroom home. Four 10 pound pails of Bio-Sanitizer tablets shipped in a single carton for one low rate. Reliably and effectively disinfect without wicking or sticking. A 10 pound pail is approximately a six month supply of tablets. Price includes a single $35.00 UPS hazardous material handling fee. Due to U.S. Department of Transportation regulations, this product must be shipped via UPS ground service. 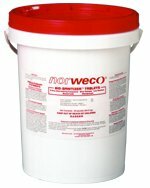 Our 25 pound pail package size is ideal for commercial water or wastewater flows of 5,000 to 10,000 GPD. Effectively disinfects without wicking or sticking in tablet dispenser. Proprietary production methods insure a slow and consistent tablet dissolve rate to minimize chemical use while still meeting discharge specifications. 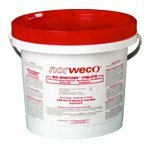 This resealable and easily handled pail is the best value for maintenance operators. Bio-Sanitizer tablets are also available in 100 pound drums that must be shipped via commercial carrier. This package size is recommended for wastewater treatment systems with flows greater than 20,000 GPD. Contact Norweco for ordering and shipping information.